I was reading a piece last week by Jaime Weinman for Vox that talked about a shift in film criticism recently and how critics have become more socially conscious than ever. While the piece is an interesting assertion of how many movies of late have come to be judged as much for their ethics as their art there was one particular section that took me by surprise and stuck with me. In a section titled "The end of Kaelism" Weinman says, "A work of art — serious or popular — isn't supposed to be judged by how much you agree with it, but by how it makes you feel and whether it can convince you of its validity." The context of this quote is key as the writer was discussing the approach of critics such as legendary New Yorker film critic Pauline Kael and Andrew Sarris, the man who invented the auteur theory, as critics who ultimately sported an "art-for-art's-sake approach to culture." I was reminded of this approach, this train of thought, as I sat watching the latest from director Marc Webb ((500) Days of Summer, The Amazing Spider-Man). I was struck by the fact that despite recognizing the predictable tropes utilized in Gifted that I was really, really into the story and that despite the clichés of the courtroom drama Webb's techniques were overcoming them in a way that was delivering a film, a piece of art, that made me feel good; that made me appreciate movies for showing me what they can do. How they can move you. I went into Gifted expecting something along the lines of a sappy, Hallmark-style melodrama with better actors and production design, but within the first fifteen minutes Gifted had convinced me of its validity — it had convinced me of its sincerity that was ingrained in its otherwise competent execution. Sure, many will dismiss Gifted for being the type of film that is emotionally manipulative because it wouldn't be mad if you shed a few tears and/or formulaic in the way that the premise is an old cliché that has been used before (specifically in 1991's Little Man Tate which I haven't seen, but more or less sounds like the same movie), but just because a movie might indeed be full of cliché or admittedly formulaic doesn't mean it's automatically bad. Webb is able to tell this recognizable story in ways that allow it to pop. The director and screenwriter, Tom Flynn, are able to prove certain tropes aren't always bad and that doing the opposite isn't always good by delivering all that is predictable and formulaic about Gifted with a warm and wholly wonderful sincerity that comes straight from the heart. 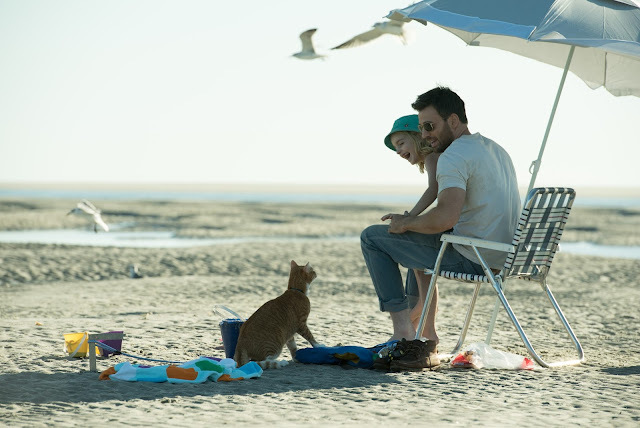 Mary (Mckenna Grace) and her Uncle Frank (Chris Evans) enjoy a day at the beach with their cat Fred. 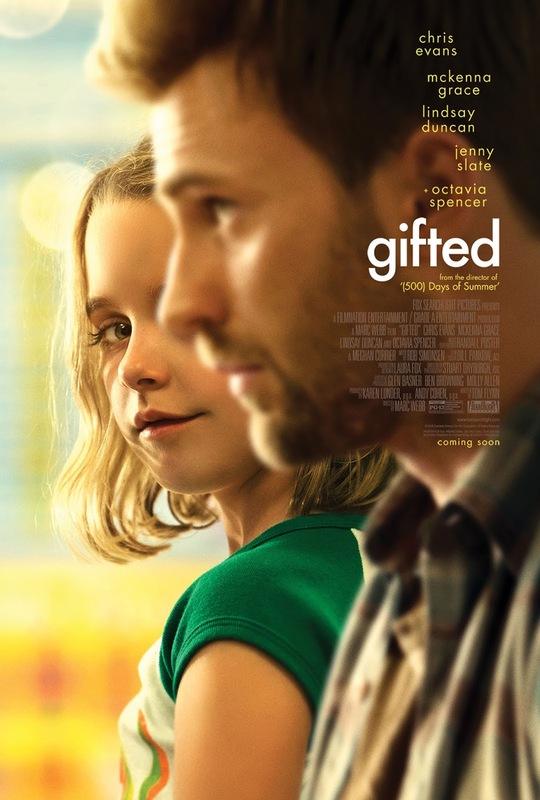 In Gifted we first meet Frank Adler (Chris Evans) who is a single man simply trying to get the niece he is raising ready for her first day of school on time. Apparently this can prove to be a difficult task even when that child is a math prodigy. The child prodigy in question is that of the spirited young Mary (McKenna Grace) who is not overly excited about her first day of first grade. After all, why would she be? She knows and understands that she is advanced and that she will undoubtedly be bored by the lessons her sweet and well-meaning, but completely unprepared teacher (Jenny Slate) will dole out daily. If the girl is such a genius why is she not attending a special academy? Why is she being kept in a normal school with a standard curriculum if her abilities are anything but? These are the questions we are meant to pose towards Frank as Slate's Bonnie and Mary's school principal (Elizabeth Marvel) are made aware very quickly that Mary is not normal and should in fact be attending a school for gifted youngsters. It is here that Frank stops her teacher and the school administration in their tracks. Frank contends that Mary knows she's different and that she doesn't need reinforcement, including being transferred to a school where she's the youngest person there by a decade, to remind her of such. Frank simply instructs Bonnie to do the opposite and dumb her down a little bit, make her into a decent human being, and that to trust him-they'll all be better off for it. Of course, there are too many people around Mary who, as she continues to display just how advanced her mind is becoming, that can only think in the vein of treating someone who is not normal as such as denying them their true potential. Frank knew this day would come and it is likely why he quit his job as a college professor in Boston and moved himself and Mary to a small, coastal town in Florida where Mary might stand the chance of making friends, being a girl scout, and loving her one-eyed cat with absolutely no concern for or pressure to solve one of the seven Millennium Prize Problems AKA seven (six as of 2003) of the toughest problems in mathematics that have yet to be solved. As these things go in the movies such plans are foiled when Frank's intense mother, Evelyn (Lindsay Duncan), intervenes and tries to gain custody of her granddaughter threatening to separate Frank and Mary. Intriguing, right? It's a solid premise that is lent the aforementioned sincerity first and foremost by the honesty that the chief performers bring to their roles. As the anchor of the film, Chris Evans is rather fantastic. The man who is known as Captain America is an empathetic and intelligent presence that, anytime he speaks, tells both the person he is addressing as well as the audience that he understands not only why we feel the way we do, but that he too has considered the emotional and logical factors of the given situation and believes with his whole being that he is doing the right thing. What is interesting about Gifted is that while Flynn has crafted his story from the perspective of Frank we are never ushered in a particular direction where we're told who to root for. Naturally, we'll root for Frank to retain custody of Mary as that seems only right given the time he's invested with her and the relationship they have developed, but there are a fair number of solid points raised by Evelyn and her lawyer that would understandably win them the case as it is presented in court. Even better is the fact it doesn't matter which side we come down on in terms of opinion, but more that Webb and his film don't make things as much about who wins as they do about the acknowledgement of pure human decency. Gifted is a vote for tenderness; a vote to not simply read the headline and rush to conclusions, but a plea to take in all factors, to get the entirety of the picture, and to come to one's verdict in a way that reflects the best facets of the human race. Evans' performance as Frank is very much this mentality incarnate. There is a scene late in the film where Frank makes Bonnie privy to a time in his life when he wasn't sure how to move forward. He tells Bonnie of the moments soon after gaining custody of Mary where he would consider taking her to child services, but that every day-when he was about to do so-she would do something cool. Something that would amaze him. It is a small insight that speaks volumes about the enormous love and reverence that can manifest in a parent as well as the greatest of devastation's when you feel you have let your child/children down. There is nothing more heartbreaking for Frank than feeling as if he's failed Mary and in scenes where as much comes to pass Gifted breaks the viewer of any cynicism they might have harbored and instead tangibly delivers profound, heartfelt moments that genuinely move you. Roberta (Octavia Spencer) waits alongside Mary and Frank for a moment they're not sure they're ready for. I hate math, but I loved Gifted. Of course, we all know it's not all the talk of the Navier-Stokes problem and the physics involved in that equation that make the film so fascinating, but rather the human drama behind the drive and need to resolve it that make it so compelling. Evelyn, who is given some rather unexpected layers by Duncan, was very clearly trying to live her life and see her aspirations achieved through her daughter, but when she couldn't deal with such pressure Evelyn then turned to doing the same through Mary. Not making Evelyn a wholly despicable person allows the film to practice what it preaches in the trope of not judging a book, or in this case decisions, by their initial appearance. Like everything in life, Mary's genius requires balance and Evelyn's point of view simply illustrates an extreme end of that balance. It could certainly be argued that Frank's ideas of how to raise Mary so that she may have some semblance of normalcy is the opposite end of the spectrum, but there at least seems the willingness to listen with Frank whereas Evelyn will hear nothing that opposes her view. That Gifted doesn't go into monologues about how to find such balance, but rather that it works through this high-wire act via the issues the characters have to navigate is what gives the film its levels of emotional resonance and a heavier weight than its sun drenched poster might indicate. At the core of all of this is little McKenna Grace who essentially steals the show despite being paired with a group of seasoned, professional actors. 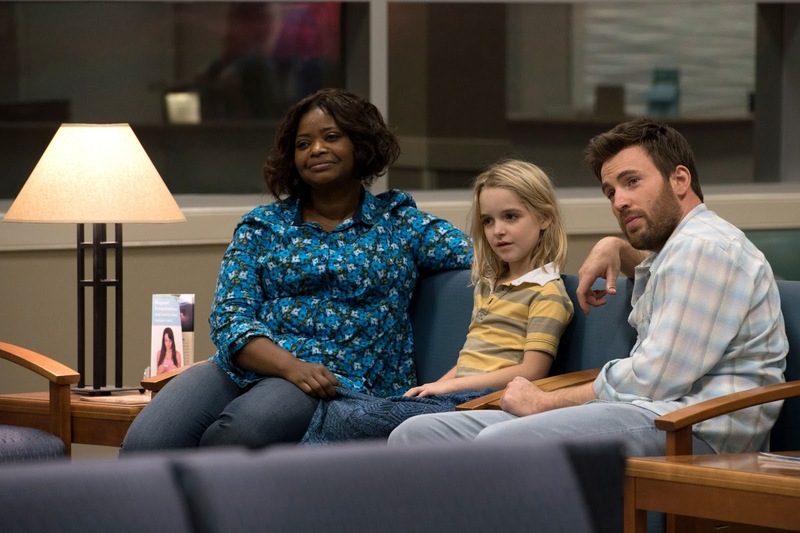 Grace's performance as Mary is so utterly genuine from that of her contemplating whether or not to pick a fight with a bully on the school bus to dancing and singing with her favorite neighbor Roberta (Octavia Spencer) that it's impossible to deny the spell she casts on you with her charm. And while Mary is an archetype in and of herself as the child genius who knows better than any of the adults around her, she doesn't even perfectly fit into that mold. Mary is advanced in terms of mathematics, but as a seven-year-old she still possesses the innocence of a child with grace never imposing a disposition that makes us think she understands the way in which the world works and adults think. Mary is a genius, that's a given, but she's still very much a child. Mary is in danger of feeling unwanted despite the fact everyone is fighting over her. These are the scales Gifted has to balance and while the third act is slightly clunkier than I would have hoped the heart of Webb's picture remains intact throughout. Ultimately relaying that it's important to use your head, but that we should never be afraid to believe in things either.